For many of us, a better diet means eating more fruit and vegetables. Many of us need to eat more veggies and less red meat. Technology can help us make better use of our farmlands. The larger grain borer beetle attacks crops like maize and cassava, threatening food security. The fall armyworm, native to the Americas, was first recorded in west and central Africa in early 2016 and then in South Africa in January 2017. Australia’s greenhouse gas emissions are on the rise. Electricity emissions, which make up about a third of the total, rose 2.7% in the year to March 2016. Australia’s emissions reached their peak in 2008-2009. Since then total emissions have barely changed, but the proportion of emissions from electricity fell, largely due to falling demand and less electricity produced by coal. But over the last year demand grew by 2.5%, nearly all of this supplied by coal. In 2015 I wrote about concerns that Australia’s electricity demand and emissions would start increasing again. This has now come true. So what’s driving the trend? To understand this trend we need to look at data from Australia’s National Electricity Market (NEM), which accounts for just under 90% of total Australian electricity generation. While the NEM doesn’t include Western Australia or the Northern Territory, it has much better publicly available data. 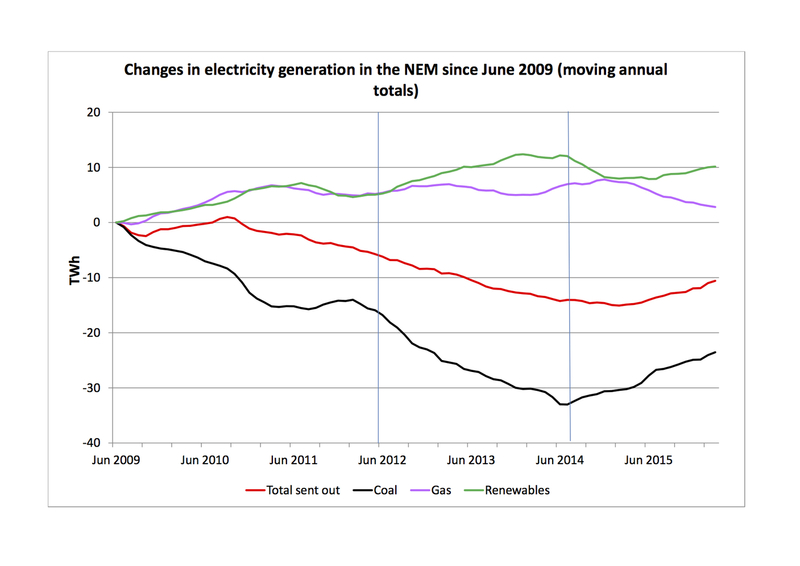 The chart below shows electricity generation from June 2009 to March 2016. The most important things to note are that, until February 2015, overall generation fell and the amount of electricity supplied by coal also fell. These two trends are closely related. In June 2009, coal was supplying 84% of electricity, while 7% came from renewables (mainly hydro and wind) and 9% from gas. Because renewables have near-zero short-run marginal costs (because they don’t have to pay for fuel) they will nearly always be able to outcompete coal and gas. This will be particularly so when demand for electricity falls. Since June 2009 coal has been squeezed out by falling demand and a growing supply of renewables and gas. Until February 2015, total demand fell 8%, gas supply rose 43%, renewable supply grew 55% and coal supply fell 18%. Since February 2015, however, these trends have reversed, which is very bad news for Australia’s emissions. Demand grew 2.5% and, combined with falling electricity supply from gas and renewables, coal picked up the slack, driving emissions 2.7% higher. Gas generation is being forced out of the market, as wholesale prices throughout eastern Australia have risen to levels set by the three new liquefied natural gas (LNG) plants in Queensland. Renewable generation, mainly hydro, increased briefly thanks to the carbon price, further squeezing out coal, but this is of course now gone. Growth in other renewable generation (mainly wind) has stalled because of the near-total freeze in new investment under the reduced large-scale Renewable Energy Target (LRET) precipitated by the Abbott government. To understand why demand is increasing we can look at the three major consumer groups – industry, business and households – as you can see in the figure below. Victoria is excluded because differences in the timing of industry reporting to the AER mean that the most recent data are not available. Exclusion of Victoria does not change the overall picture, as it has shown the same trends as the other NEM regions. After growing until 2012, industry demand fell sharply because of closures of several major establishments, most notably aluminium smelters in New South Wales and Victoria. Since 2015 very rapid growth has occurred in Queensland, driven by the coal seam gas industry. Extraction of coal seam gas requires the use of enormous numbers of pumps, compressors and related equipment, to first extract the gas from underground and then to compress it for pipeline transport to the LNG plants at Gladstone. Initially, the industry used gas engines to power this equipment, but then realised that electric motor drive would cost less. The government-owned Queensland electricity transmission business, Powerlink Queensland, is making major investments (paid for by the gas producers) in new transmission lines and substations to meet this new demand. By the end of 2017-18, electricity demand could increase by 20% in Queensland and by 5% for Australia overall. All of this demand, at least initially, will be supplied by coal-fired power stations, increasing Australia’s total emissions by about 8 million tonnes, or roughly 1.5%. As a side note, the LNG plants in Queensland will not themselves use electricity from the grid, but will use about 120 petajoules of gas each by 2017-18, adding another 6 million tonnes to national greenhouse gas emissions. 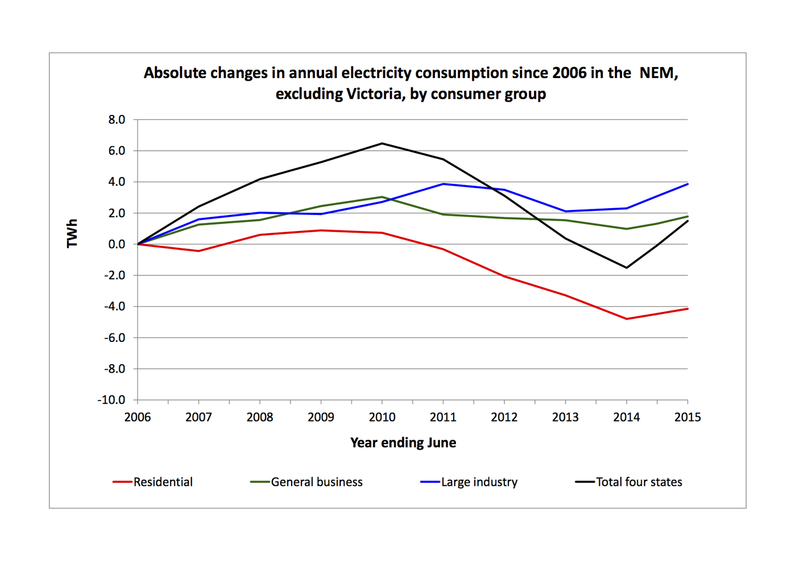 Household demand fell since 2010 due to energy standards on appliances, increasing electricity prices and a one-off behavioural response due to unprecedented political attention to electricity costs thanks to climate policy. Now electricity prices have stabilised or are falling and attract much less attention. Moreover, fewer appliance energy standards are being introduced, slowing the decrease in demand. The result is that average electricity consumption per household, which fell by 17% between 2010 and 2014, has stabilised. In the absence of stronger energy efficiency policies and programs, residential electricity consumption can be expected to grow in line with population. Business is the largest of the three consumer groups. Electricity demand fell slightly between 2010 and 2014. This is because electricity intensity, the amount of electricity needed to produce economic value, fell 3% each year; that is, slightly faster than the economy grew. It now appears, however, that in the past year the fall in electricity intensity has almost ceased, so that total consumption has increased in line with economic growth. In December 2015 the federal and state governments announced the National Energy Productivity Plan to increase energy productivity 40% by 2030. This is part of the plan to meet Australia’s 2030 climate target. Energy productivity is the economic value produced per unit of energy. The 40% goal is equivalent to a reduction of just under 30% in the energy intensity of the economy. In the case of electricity, had the trend of the period 2010 to 2014 continued, this would have been achieved quite easily. It now appears to be a much more challenging goal, requiring the urgent introduction of a range of new energy efficiency policies and programs. CORRECTION: The lead image has been corrected. It previously incorrectly showed aluminium works at Gladstone, Queensland. Conservation parks are growing, so why are species still declining? It’s now five years since the International Year of Biodiversity, and nearly 15% of Earth’s land surface is protected in parks and reserves. By 2020, we should reach the agreed global target of 17%. This is good news for species diversity, right? Not really. Biodiversity loss continues apace despite these global agreements and conservation actions, and is unlikely to stop any time soon. We explored this apparent paradox with the help of a simple model that simulates the current relative proportions globally of the area of remaining tropical forest, and the area that has been cleared for agricultural development. We used the model to look at what happens to these proportions when networks of conservation reserves expand. Our research led to two insights: both the area of forest protection and the area of clearing for development can expand at the same time; and the governance regimes responsible for protected areas can actually be weakened by protected area expansion. This is because pressure for the creation of new protected areas comes largely from public discourse. In our model we depicted tropical forestlands as consisting of protected forests; traditionally managed or “unallocated” forests; and cleared agricultural land – plausible categories that broadly reflect the current status and areas. c) maintain current habitat and restore agricultural land to forest, thereby opposing clearing for development. We use the model to present three plausible scenarios of governance regime and land-use change trajectories. The forces that affect land use in forested areas. Our dynamic hypothesis depicted in the figure shows how the driving forces of development and protection, while competing for the remaining stock of forest habitat, do not necessarily oppose each other. Consequently the total stock of forest habitat can decrease while the area of protected forest increases. The force that directly opposes clearance of forests for development is the one that maintains existing unprotected forest use regimes or that seeks to restore cleared forest. The relative power of the governance regimes that “develop”, “protect”, or “maintain/restore” will determine what ultimately happens to the area of remaining forest habitat. Biodiversity loss will only stop when the net loss of forest habitat each year is zero – which means halting the clearing of tropical forest for agricultural development, as well as increasing protected areas. But in the real world we are doing the opposite – investing heavily in the force that drives tropical forest clearing. The leaders of the G20 nations recently gave a huge boost to the power of development regimes, by pledging to invest up to US$70 trillion on new infrastructure projects by the year 2030. This is precisely the kind of driving force that will harm wildlife conservation, and which the growth of protected areas will fail to counter. It seems counter-intuitive, but our research suggests that increasing the area of the world’s conservation reserves can also reduce the perception of the risk of ongoing biodiversity loss, primarily because the focus on the 17% protection targets takes our eye off the critical issue of halting habitat loss. As a result, the global distribution of protected areas is currently “high and far”, skewed toward mountainous areas and places far from development frontiers. If achieving 17% leads the public to conclude that biodiversity is now safe, it can lower the main feedback currently giving power to the protect force – public pressure for political action. This is compounded by the phenomenon of extinction debt – the time delay between habitat loss and the resulting extinction of species that live here – which hides the impact of development on wildlife in both protected and unprotected areas. Conservation has traditionally sought to identify and protect “representative samples” of different types of ecosystems. Recently, however, there has been an increased interest in identifying and protecting areas based on cost-effectiveness criteria. We suggest instead that one useful leverage point for slowing tropical biodiversity decline would be to concentrate on placing protected areas near active agricultural frontiers, which could help to constrain the march of agriculture through tropical forests. This approach has already been shown to work in urban planning, including in Australia, where it has been used to fight urban sprawl. A second useful leverage point is to set global targets that include both a percentage for protection and an overall percentage for remaining forest habitat. Globally, forest cover now is at 62% of its original extent, while 75% has recently been identified as the extent necessary to stay within planetary boundaries. There is currently much debate in the conservation literature about “land sparing or land sharing”. Our scenarios suggests that while land sparing through rapid protected area expansion has immediate conservation benefits, these benefits are lost over time as species populations eventually crash. The land-sharing scenario, through strengthening the power to maintain current forest habitats, suggests better biodiversity outcomes in the long term. Realising these long-term benefits may only be possible with a resurgence in traditional forest-management practices that promote wildlife-friendly agriculture, and that restore forest habitat. All too often the governance regimes of traditional forest owners have been subsumed by the State in order to allow commercial forestry or forest clearance for agriculture. However, there are signs that this may be changing in some places through commercially viable drivers of sustainability. Our analysis suggests that human activity will continue to damage wildlife diversity, in spite of successful efforts to meet the target of protecting 17% of Earth’s land surface. The reason is that a large percentage of natural habitats are disappearing in the face of development, particularly through the clearing of tropical forests for agriculture. This destruction will continue because the overall balance of land management is still geared towards ongoing clearing for development rather than sustainable re-development of our current human footprint. Getting out of this trap will require an understanding of the processes that reinforce this perverse situation, and the realisation that this system needs to be redesigned. This is a new frontier in conservation science, and our new analysis is hopefully a first step towards unravelling this complex social-ecological problem. What we need to do next is to identify the critical feedback relationships that can empower natural resource management, and to put reasonable limits on the power of development regimes. Otherwise, the world’s biodiversity will continue to dwindle even if conservation reserves expand rapidly. This article was coauthored by Craig Miller, a former researcher with CSIRO Sustainable Ecosystems. Ro Hill is Principal Research Scientist, Ecosystems, Biodiversity Knowledge and Services Program at CSIRO. Barry Newell is Visiting Fellow, Fenner School of Environment and Society at Australian National University. Iain Gordon is Chief Executive at James Hutton Institute. Michael Dunlop is Senior Research Scientist: land-water-biodiversity-climate at CSIRO. The link below is to an article reporting on the increasing numbers of Nepal’s Bengal Tiger population.